Jazz painist Eldar has worked intensly to deepen his understanding of jazz-bebop music. 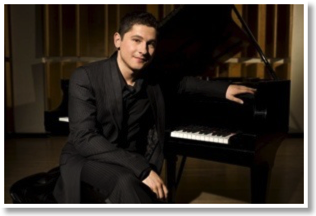 He first came to the U.S. from Kyrgyzstan in the former Soviet Union when he was 10-years-old, and his first performance was at the Interlochen Center for the Arts in Michigan. After that, Eldar moved up the ranks and performed on the Marian McPartland’s Piano Jazz show when he was just 12-years-old. Eldar has also performed at different festivals including Jakarta, South by Southwest music conference and CMJ in New York City. He has also toured throughout Asia, America, and Europe. Currently he is performing in support of his recent release titled Three Stories. This interview was completed via email while he was on tour. 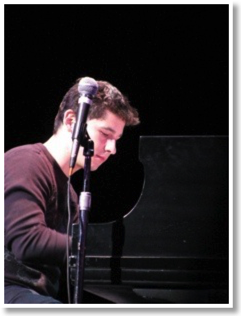 Eldar Djangirov: I would have to go back to when my dad first played the piano that he bought for me. When my mom taught me the first piano lesson at 5, that was also a great memory. I fiddled with the instrument, but never really practiced a lot until that point. I played a Russian festival at 9 where I met Charles McWhorter who supported the arts and suggested I visit Interlochen in Michigan. Attending Interlochen is a great memory. Around that time I gave my first recital in Kansas City when I was 11. I made my first record at 13. Every record I have ever made has created a beginning of a chapter in my life, and the mark of creation of a new memory. Also playing on the Grammys and getting nominated was an honor. Going on the first European Tour around the time of releasing "Live at The Blue Note" with the trio with Marco Panascia and Todd Strait was a great experience of travels and music. It's interesting because if you ask me a month from now, parts of this answer will change. I have pretty eclectic taste, and draw inspiration from many sources. Some responses will be logical to readers, other might come as a surprise. I will have to begin with Oscar Peterson's album "The London House Sessions." It's a 5 CD package. I figure if I'm on a desert island, I might as well take a long album with me and enjoy his playing. I always seem to find new things every time I listen to his playing even though I heard a particular track many times. He is the first piano player I ever heard, and found Oscar inspiring in many ways from his clarity and groove, to his ideas and charisma. Glenn Gould's "Well-Tempered Clavier Book I" is a must because I love his playing. In all music I always gravitate towards the artist telling their story in the most objective way -- I am an observer going into their world to experience it. Yet I always look for that message to be presented to me with clarity -- the logic of all creative aspects, expression, and execution. Nick Drake's "Five Leaves Left" is also a beautiful album which has great songs. Meshuggah's "Chaosphere" is a great work. Some isteners seem to be offended by the first listen. It's beyond a metal band. It's a genre of it's own with incredibly complex musical architecture especially based in rhythm. Tomas Haake on drums is also great. Pat Metheny's "The Way Up" is a great record. Beautiful music presented in a gorgeous way... Branford Marsalis' "Crazy People Music" swings hard with Tain on drums, Kenny Kirkland on piano, and Robert Hurst on bass -- great musicians. Eminem's "Slim Shady LP" is a great record. People concentrate on his controversial lyrics, but the biggest reason why I like him is his phrasing and amazing sense of time. Many musicians can learn a lot by listening to how he rides the beat and phrases around it. Murray Perahia's "Mozart Piano Concerto #20 & #27" with the English Chamber Orchestra would be a great choice for me. Well, anything with Murray... Bill Evans made a great album called "Sunday at the Village Vanguard." Anything with Bill Evans is a great choice. I just finished reading a book about him called "How My Heart Sings." It is a phenomenal book that tells the story of his life beautifully. He is an amazing musician in every way. I would grab "Miles Smiles" from the Miles Davis catalog. I like that record because of the fantastic band and great tunes. Having said all that, I would have to carry some contraband with me on top of the 10. I would sneak my last record "Three Stories" as well as "Virtue" to the desert island. Those are my two most recent records which I'm very happy about. What would be your top ten music concerts you've most enjoyed? I wasn't sure if this is my own concerts or notable concerts by other artists that I have seen -- so I included both. I just came back from a tour of Germany. 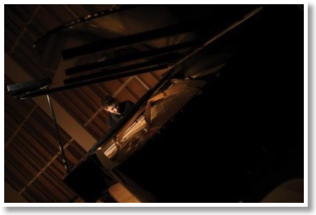 My solo piano record "Three Stories" was released there. I really enjoyed playing in Munich because it is so fresh in my mind. The piano was great, I felt energetic, and the audience was awesome. I enjoyed making music for the people very much. Fresh in my mind is a week run at a small club in Bern, Switzerland called Marian'sJazz Room. It is a very cozy place for me to kick off my solo tour.Playing a venue for 5 days with 2 shows a night was a good experience for trying out many things musically. I recently played at the RivieraMaya Jazz Festival. Playing in front of 10,000 enthusiastic people with the trio was a rush. I went to Brazil and played a set with the trio with Joshua Redman as a guest and played at the Ouro Preto JazzFestival. It was a great festival and a fun set of music to play.Going back a few years I have a good highlight that marks a good era for music as well. When Rose Theater opened in 2005, Wynton Marsalis invited me to play at the opening gala event. This was the beginning ofJazz At Lincoln Center and the venues that the building houses. It was a memorable event. As far as concerts which I attended that were memorable, a few come to mind. Seeing Billy Taylor live in Kansas City was amazing when I was about 13. I've been lucky to be a part of many things with the late great Billy Taylor such as various programs at theKennedy Center and the White House. He was a beautiful man and has done so much for the music and many young artists. He will always be remembered as a great man. Also seeing Dave Brubeck was great around the same time. Seeing a Bjork show in New York was a great experience not too long ago. Pat Metheny playing live is a fantastic experience which made a hugely positive impression on me when I was younger.Finally I had a chance to meet and see Chick Corea for the first time not to long ago in 2010. I have gotten to know him a bit too. I've been a fan of his for quite some time. His performances were magnificent. There are many artists I enjoy listening to. I would begin with the musicians that play in my trio. Armando Gola plays bass. He released a great record called "Live Things" and I'm sure he will be making more music in the future. Ludwig Afonso on drums is a great musician as well. It's tricky for me to use the term "up and coming" because some musicians that come to mind might not have mainstream fame but have been around for some time in their genre and are seasoned veterans of music regardless of age. Felipe Lamoglia plays on my album who is a fantastic saxophonist. Another musician comes to mind is Mark Shim on saxophone.Both are some of the best saxophonists around today. Everyone who hears both of them will be impressed by their original sound and ideas. My friend Taylor Eigsti is a fine piano player with fresh ideas. A young trumpeter named Ambrose Akinmusire sounds terrific. I've known him and watched him over a decade when we first met. Justin Brown is a talented drummer who plays great ideas. Another drummer I've had pleasure working with who plays every week in New York is Ari Hoenig. He is very talented indeed. Earl Travis is a bass player who has played in my trio a couple years back. He is a great person, grooves hard, and sounds great. Todd Strait is a drummer who's ability is astounding. I've learned more from him about playing in a trio than perhaps anyone because we began playing when I was about 11 or 12. He had a ton of information that he has passed on to me over the years. I feel an immense gratitude for that. He is also an amazing human being.